Depart from the USA on flight to Lisbon, Portugal. Arrive in Lisbon and enjoy an orientation drive through Lisbon, highlighted with Mass and a visit to the birth site of Saint Anthony. 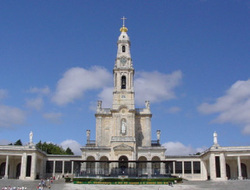 Continue on to Fatima, the place where the Blessed Mother appeared in 1917 to three simple shepherd children and exhorted mankind to pray for world peace. Tonight you may participate in a candlelight procession. Dinner and overnight in Fatima. Six times, from the May 13 to October 13, 1917, the Virgin Mary appeared to three novices belonging to the diocese of Leiria. The basilica was constructed in 1928 and contains Francesco and Jacinta’s graves, and celebrate Mass at the Little Chapel of the Apparitions. 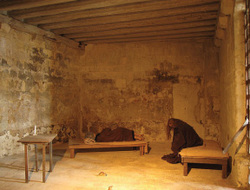 Visit the Hamlet of Aljustrel, where the children lived, and Valinhos, the site of Our Lady’s appearance after the children’s return from prison. Follow the Stations of the Cross along the Via Sacra (The Sacred Way) culminating in the Chapel of Calvary, which overlooks all of Fatima. Dinner and overnight in Fatima. Drive to the town of Santarem, one of the oldest cities in the world, where you will have Mass and visit the Church of St Stephen, which contains the oldest recorded Eucharistic Miracle. Stolen by a woman in payment to a sorcerer, the Host began to emit a brilliant beam of light and then to bleed. Reverently returned to the church of St Stephen, this miracle has been on continuous display since 1269. In the afternoon, continue on to Lisbon airport for your flight to Toulouse, France. Upon arrival, you will be met by your local guide and transfer to Lourdes, the birthplace of St Bernadette, and where Our Lady appeared in 1858. Dinner and overnight in Lourdes. See a video presentation telling the story of Lourdes and enjoy a guided tour of Lourdes which will include the sanctuary; the Grotto, where Our Lady appeared under the title of the Immaculate Conception; the Basilica of the Rosary, the Basilica of St Pius X, the world’s largest underground church; Boly Mill where St Bernadette was born and the “Cachot," an abandoned prison where Bernadette’s impoverished family lived; and the baths where hundreds of miraculous cures have taken place. Each evening you will have the opportunity to participate in the candlelight procession. Dinner and overnight in Lourdes. Depart for the USA. Note, there is a Pre-pilgrimage or Extension Package available for this itinerary including Santiago, Spain.